Heartlight – Share God's Grace. The world at the time of Isaiah was a troubled place. The northern kingdom of Israel had become a vassal state ruled by the Assyrian empire and brought to ruin by a series of unfaithful and corrupt kings. Judah, where Isaiah lived, was still independent and prosperous but under constant threats by powerful foreign governments. In Isaiah 9 the prophet gives a promise of hope and salvation to a weary land and an anxious people. When Jesus began his ministry more than 700 years later, the land, now ruled by the Roman Empire, was still troubled and its people lost in darkness. Isaiah 9 was quoted in Matthew 4:16 to emphasize that Jesus was the fulfillment of Isaiah’s words and the people would be freed from the darkness that imprisoned them. Two thousand years later the world is still a troubled place, filled with corruption, dysfunctional government, prejudice, genocide, economic disparity and injustice; the refuse of humanity’s disobedience to God. Or is it possible that the atheists are right and there is no God? Is the Bible a collection of words and its prophecies empty statements of delusional men? Are these nothing more than utterances from a fictional deity, empty and meaningless? For if the God of the Bible is real and has promised a light to bring hope, justice and peace, shouldn’t we have experienced it after nearly 28 centuries? How do we, followers of the Biblical God, explain to non-believers the unfulfillment of God’s promises? How do we explain it to non-Christians who question our legitimacy, or even to ourselves? Humanity has always turned to great leaders who can raise them above the flaws of human nature. From the Judges to Kings to modern politicians we have always followed leaders of promise and ultimately discarded them. This includes Jesus. If God is real and has fulfilled His promise, then we need to look at ourselves for having failed to receive God’s covenant and rejecting our savior. We choose to follow a light that illuminates our world and banishes the darkness that surrounds us, believing that the things which oppress us come from others who are different and seek control over our lives. We are wrong in believing the darkness is imposed on us from somewhere else, but we are correct in understanding that a leader is needed to banish the blackness. The dispute has always been: who that leader is and how will we know? 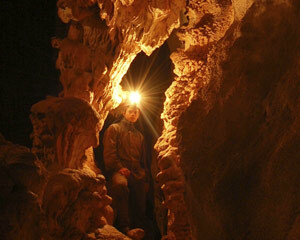 Years ago my wife and I went caving at Wind Cave National Park in South Dakota. This was not the guided tour that most people take with smooth concrete walkways and well-lit passageways illuminating the beauty and splendor of God’s works. We went spelunking, which required rugged clothing and lighted helmets. Along with our guide and another couple we crawled, shimmied and climbed through a labyrinth of tunnels, narrow openings, crawlspaces and tiny subterranean rooms. At one point the guide had us turn off our lights and we were plunged into total darkness. It was a blackness that engulfed you and nothing else existed except darkness. It was, “Blacker than a hundred midnights Down in a cypress swamp.” The only way I knew my hand was in front of my face was when I touched it with my nose. This total absence of light created a darkness that was absolute and nothing else in the world existed. I’ve often wondered if anyplace else could be as dark as that cavern in the depths of the earth. It has occurred to me that the one place where light cannot enter and it may be “Blacker than a hundred midnights” is inside the human body. Science may prove me wrong for there could be electrical impulses that generate sparks, but I’m inclined to think that the darkest place in our world, literally and metaphorically, may be the human heart. The people of Isaiah’s and Jesus’ time believed God would send a “great light” and that light would be a skillful warrior or powerful king. We still believe this today, seeking charismatic politicians, or religious, cultural or social prophets to be our guiding light and rid the world of the darkness that surrounds us. Isaiah was a prophet who received and shared the word of God. Perhaps even Isaiah didn’t fully comprehend what God was foretelling. Like all men of his faith he may have anticipated a warrior or king. After all God doesn’t reveal everything to His children, just what He needs us to know. But Jesus knew the plans God had for us and he was the light that God had promised through Isaiah. So the issue for Christians isn’t the divinity of Christ because we cannot definitively prove or disprove His inviolability. That is an unquestioning act of faith. Nor can we doubt that Jesus was the ultimate expression of God’s love for us. Again this is an act of faith to be accepted and acknowledged. Jesus is the light which Isaiah prophesied, a light which shines in the darkness. The question is, “Will we allow that light to shine in the darkest place in our lives – the human heart? If we see the light as an external force used to chase away the dark that surrounds us, then we will always be a people who fear the night. The light of God’s love cannot remain in the pages of a sacred book or the sanctuary of a church, a lighted shelter that separates us from the dark. It must be kindled in our hearts, at the very center of our being so we can use it to cast out the darkness that engulfs us. If we do not allow the darkness of fear, doubt, distrust and unbelief to be banished by the light of Christ then we cannot be transformed into God’s instrument for good. And if we cannot be transformed then neither can the world. So to answer the unbelievers, the doubters and the skeptics, Isaiah’s prophecy has been fulfilled and the light of Christ has come into the world. Just as a beam of light can rid the blackness in the bowels of the earth, the light of Jesus Christ can shred the darkness in our hearts. Nearly every day and sometimes every hour, we must face that darkness. We can either invite Jesus in or we can seek other ways which have proven inadequate. As he walked by the Sea of Galilee, he saw two brothers, Simon, who is called Peter, and Andrew his brother, casting a net into the sea for they were fishermen. And he said to them, “Follow me, and I will make you fish for people.” Immediately they left their nets and followed him. This was not the first time the fishermen had met Jesus. They listened to him speak to the crowds and sought him out to learn and understand his teachings. They returned to their homes, to their nets and discussed what he had told them and felt a strange stirring in their hearts. When Jesus called to them they were willing to allow the light which Isaiah spoke about to enter into their lives. They choose to follow not a king or a warrior or a high Priest but a teacher who they allowed into their darkest places. Like so many of us today those fishermen had their moments of doubt and uncertainty. Fear crept into their hearts, greed and pride dimmed the light of Jesus. Each would turn back to the light, each would be transformed by the light and each would transform the world. Each day we need to answer the call Jesus made to the men on the shore, “Follow Me and I will make you fishers of men.” And when we answer that call the dark places in our hearts will receive a great light and we will no longer be a “… people who walked in darkness” but those on whom a “…light has shined”.